During the past 18 years I’ve had my own business in one way or another, I’ve learned that it is important to constantly try to improve. After some digging around and some chatting with our clients I discovered that we were falling off in our delivery of projects and making sure that we kept our clients completely satisfied, along with projects going on when we slip into what is known as ‘Scope Creep’. So I had a good hunt around for a course that would help us deliver better a better and more professional experience for our customers to ensure that we can provide not only awesome customer service but to make sure that we can manage our projects start to finish without letting anyone down on delivery. It was at this point I found and researched a course called WP Elevation run by WordPress consultant Troy Dean and decided this was the course that could help us make some serious changes for the better in the business. The course is six weeks long, but as I delved into the depths of the content it was around about the same time that we started to see the wedding industry go a little quiet, which just means that we get really busy! 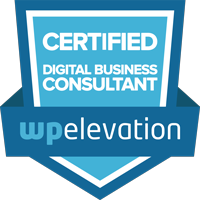 It has taken me a little longer than six weeks to ensure that everything on the course is complete and now I am delighted to say that at around midnight last night I completed the course to become WP Elevation Certified. So what does this actually mean for UK Wedding SEO? Well for one we have and are adjusting all of our procedures to better our business and ensure that we are delivering amazing projects on time, as well as offering an amazing after care to all of our clients in all levels of our business. We don’t often blog about our own achievements but this year has been quite the year around here, we have become qualified in all funky things on Google, such as Google Adwords, Google Analytics and in turn we are heading for Google Partner qualification early in 2016, we became Inbound Certified by HubSpot and to top it all we are now Certified WP Elevation WordPress Consultants. I would say that is a pretty awesome way to bring this years study to an end. Now with under a month to go until we have our Christmas break we have a pretty full schedule but we are as we always have been committed to offering the best Inbound Marketing and Website Design services to every level of the Wedding Industry that is possible! Thank you all for your continued support and we look forward to helping you build your business and grow with us during the next 5 years of business!